Ok, since I spent a bit more time than I really wanted researching this one I figure I might as well spotlight it. Microsoft Mail "For PC Networks" is a sort of crude mail system that depends on shared files for a message store. But confusingly, there were two distinct "Microsoft Mail" products. One for AppleTalk Networks, and one for PC Networks. 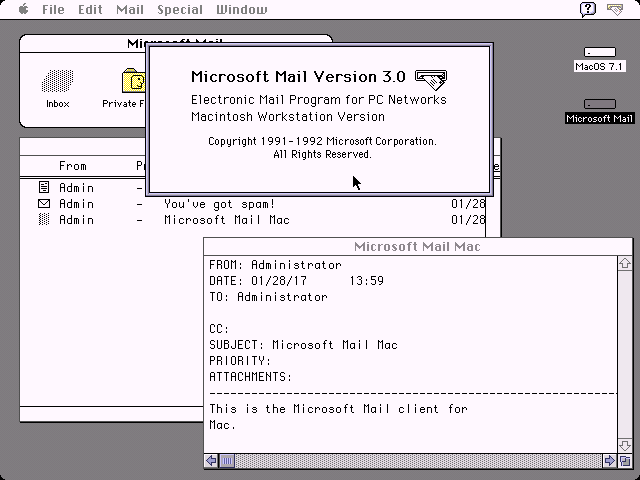 Microsoft Mail for AppleTalk Networks was introduced in 1988 and based off of InterMail from Interactive Technologies, Inc. Later versions had a DOS client for PCs using AppleTalk. It later became Quarterdeck Mail, then Star Nine Mail. Winworld does not have a copy of this version, and details about it get mixed up with "Microsoft Mail" for PC Networks. Microsoft Mail for PC Networks is a shared file post office based mail server. It is designed to work with IBM, Microsoft, and Novell network file shares. This version includes clients for DOS and Microsoft Windows 2.x/3.0. The Windows client is a 16-bit Windows 2.x application that is also compatible with Windows 3.0. The server, as such, is a DOS based product, intended to run on a dedicated file server. The DOS component is responsible for moving messages between postoffices and other message processing. Otherwise the clients could operate with only a simple shared folder. Similar to how Microsoft Access shares a database between multiple users, that gets to be a very bad idea when you have many untrusted users. But you have to realize that at the time people often had to piggyback on existing systems, where it might not have been allowed otherwise. While the initial server components were for DOS, they eventually added some support for running under OS/2 1.x with IBM/Microsoft Lan Manager. There were clients available for DOS, OS/2, Windows 3.x, and Apple Macintosh. I'm still a little confused about how Macs are supposed to be set up. As far as I can tell, a server would need to share the mail store via Apple File Sharing, seemingly with one Mac acting as a "gateway". But if the Mac client can, one way or another, get access to the same directories/files then it will open and run. There were many connectors for Microsoft Mail to other systems and only a couple are archived here. Off hand there were connectors for MCI Mail, AT&T Mail, 3Com 3+Mail, IBM PROFS and OfficeVision, Novell Message Handling System, SMTP, and X.400. Needless to say, Microsoft Mail had quite a bit of coverage and was rather popular in large companies. 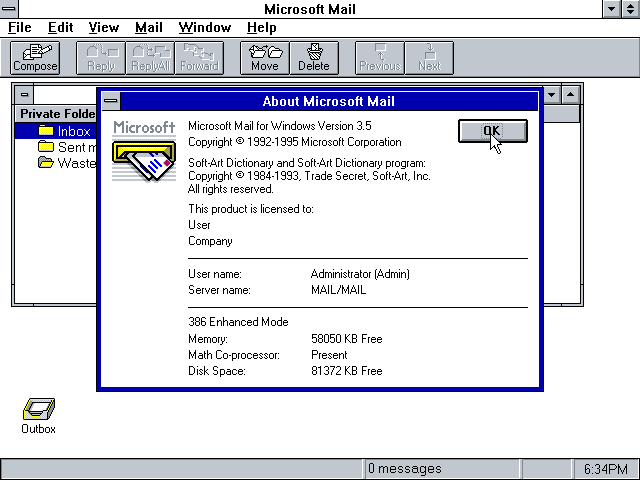 Microsoft Windows 3.11 for Workgroups bundled a version of the Microsoft Mail client. It lacked the mail server components, but had the ability to create a "workgroup" postoffice. This could be placed on a file server, or shared directly from the workstation using WFWG's built in file sharing. The final version before it was replaced with Microsoft Exchange Server was version 3.5. Supposedly 3.5 adds native 32-bit NT versions of the server executable. But the version posted here seems to be just for MS-DOS. That suggests there should be another 3.5 version "For NT". As Microsoft made the first release of Microsoft Exchange Server (a proper client/server system with a robust messaging protocol based on X.400), they started Exchange's version number at 4.0, to position it as a direct replacement. If I recall correctly, the Exchange client for Windows 95 had an optional component that could connect to a 3.x mail share. Browsing old magazines suggests an AppleTalk gateway could be installed on the same system as Mail for standalone use, otherwise something such a Mail's MHS gateway was installed on a Netware server. Provided that both clients were using Mail on the same platform there were minimal issues, unless cc:Mail or mixed platforms and so forth were involved due to a lack of e-mail standards. I was only familiar with the Windows for Workgroups version so thanks for sharing. 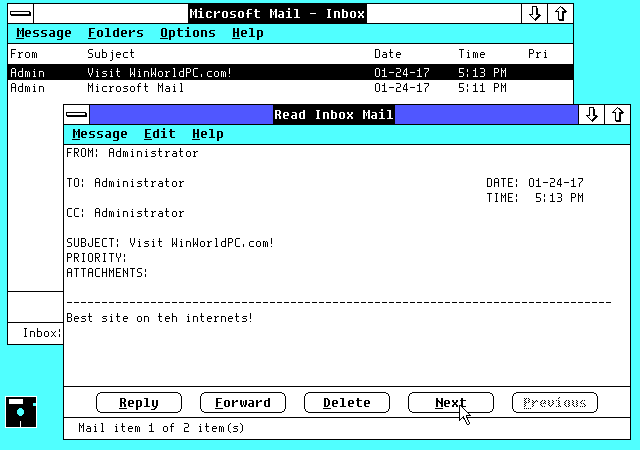 MS Mail 3.5 should be on Back Office 1.5 (was there a 1.0?). I never could figure out how to setup the SMTP gateway although that may have been fun. We were still using MS Mail well into the late 2000s in a shipboard environment. It could be made to work with Windows XP and Office XP/2003 and although it was unsupported it worked quite well. Post office user lists worked with the Outlook Address Book, etc. and it was very stable. Once we migrated to Office 2007 that was the end of MS Mail.